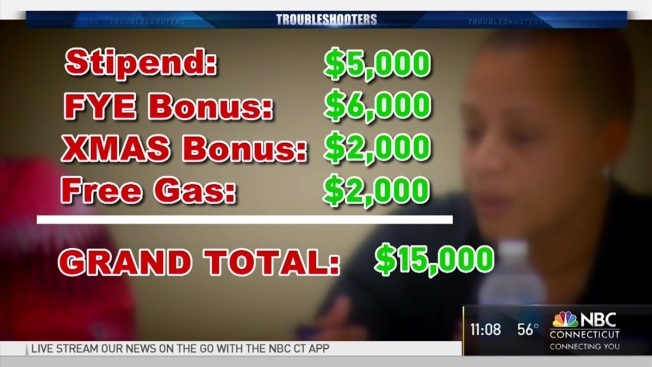 One night after the NBC Connecticut Troubleshooters uncovered what some would consider generous perks for a local fire commission the commission told citizens at its monthly meeting it will take steps to address their concerns. People in Bloomfield have shared their displeasure with what we uncovered about three volunteer Blue Hills Fire District commissioners. Documents obtained by the Troubleshooters show Ariel Jaunai gets a $5000 annual stipend. Last year she also received a $6000 fiscal year end bonus, a $2000 Christmas bonus and 20 gallons of free gas per week, worth at least another $2000 per year. Jaunai’s grand total of roughly $15,000 for the most recently completed fiscal year. Tanya Farmer, who chairs the board of commissioners, also received the same…totaling approximately $15,000. Jerry Hughes, a retired Blue Hills firefighter, got a little less. He receives the $5000 stipend and got the $6000 year end bonus. His Christmas bonus was $600, and he has not taken the free gasoline, so his perks total close to $12,000. Citizens want a set a bylaws to spell out what the commissioners actually receive…because right now they don’t have any. Commissioners have told us in terms of the stipends, gasoline and christmas bonuses “Those precedents were set many, many years ago and have been followed traditionally by each administration” and “performance bonuses began approximately 3 years ago.” Commissioners said they now plan to have bylaws drawn up by early next year by March. One point of contention…who will draw up these bylaws? People from the public in attendance would like to have input, but right now it is not clear if they will.